When the master grows big, and has a lot of nodes, there is a risk of disk IO becoming a bottleneck. To reduce this disk IO, you can use the RRD Cache Daemon. This will spool RRD changes in a queue, and flush changes on demand, and periodically. This will replace lots of random writes with a much smaller amount of sequential writes. The effects on disk IO can be quite dramatic. This example is a graph of a munin master with 400 nodes. Even with storage on mirrored SSDs, the effect of adding rrdcached is an immediate reduction in IO, and especially on wait times. Create a directory for the rrdcached journal, and have the “munin” user own it. (in this example: /var/lib/munin/rrdcached-journal). Set up a separate RRDCached instance, run by the munin user. The following command starts an RRDCached instance, and can be added to /etc/rc.local. Note: While testing, add “-g” to the command line to prevent rrdcached from forking into the background. Recommended: If you have systemd or upstart installed, use the examples below. There should be no messages regarding rrdcached in /var/log/munin/munin-update.log. …and you should then check for permissions problems. For a munin master with 200 nodes, this could well grow to 100MiB, depending on the number of plugins, and the spool file time parameters. 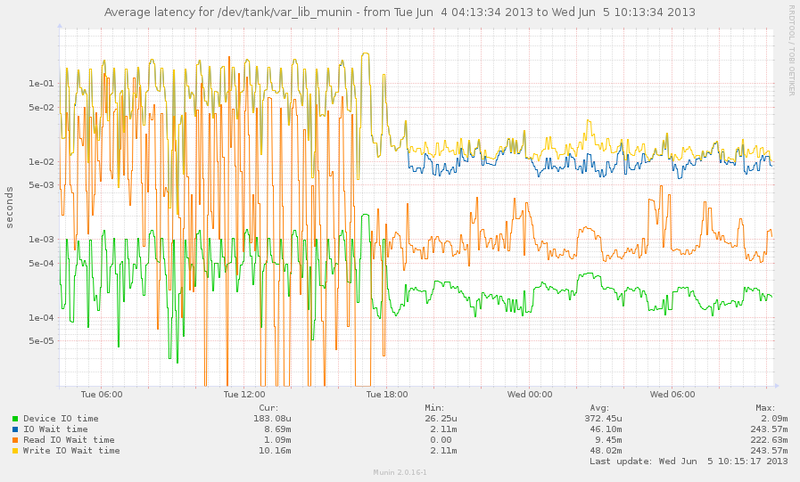 Munin plugins to monitor rrdcached are in the distribution. You can download them also from our repository plugin for stable 2.0 and plugin from master branch You need to configure your munin-node to run this plugin as group rrdcached.